This is an update to the Bike Theft incident of a month and a half ago. I came home from a business trip to London to discover my precious 2011 Specialized Vita Sport had been stolen from my courtyard. As a cautious person, who normally locks my bike indoors for extended periods of time, you can imagine how devastated I was to find that it was gone. I posted signs in my building and around the neighborhood, I filed a police report, but still had no chance, in a city where 50,000 bikes are stolen a year, of finding it. 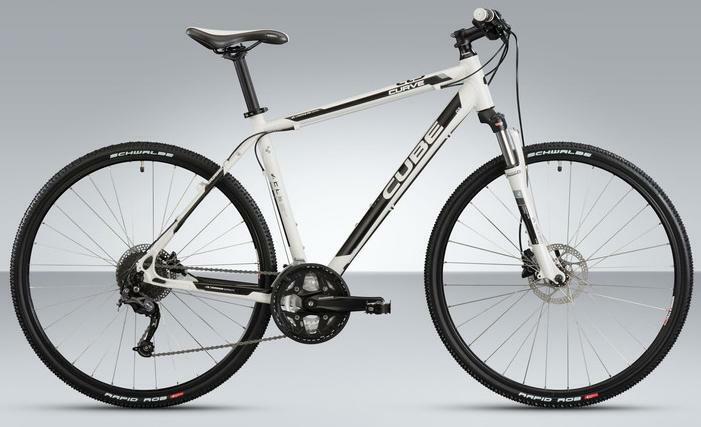 Coulda Been Mine – if not for the 13.5 Kilos! So after many long, internal debates and frustrated searches, I finally found a dealer near my apartment, Pedalum Mobile, that specializes in…(drum roll, please) Specialized! I walked in and felt happy as I saw the walls were lined with the most beautiful bikes of the highest caliber, (or pretty damn close to it!) I took the men’s version of the bike I adore, the Sirrus, for a test ride and was thrilled at how lightweight and easy to ride it was. After commenting to the salesmen, (who humored me in German, and then told me that my German was great but we could switch to English if I preferred, since it was also his mother tongue!) that I wished I could just buy the same bike again, he told me he could make magic happen and order the bike I dreamed of to arrive 3 days later! So here we are 3 (business) days later and I just got the call that my new 2012 Specialized Vita Sport is waiting with open arms…and spokes…for me at the shop! Can’t wait to go pick it up!! 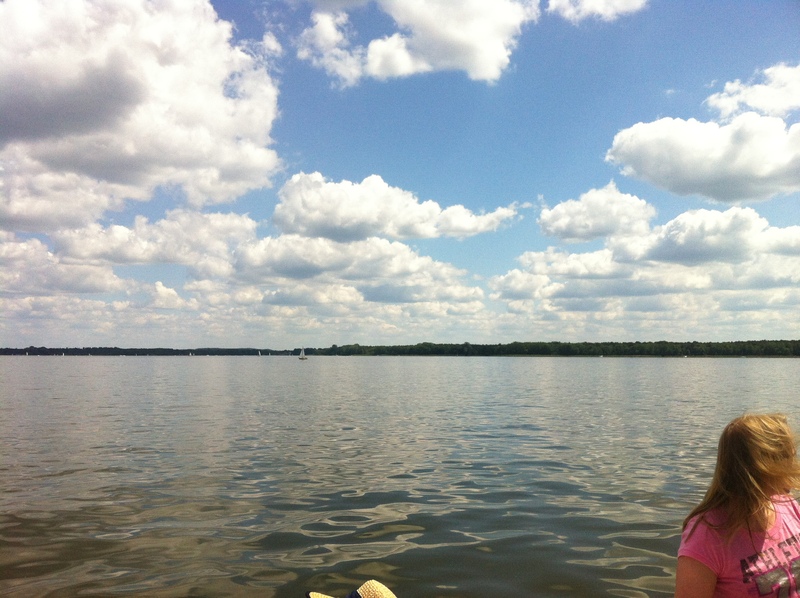 Today started as any ordinary holiday Monday – GREAT! I woke up with a surge of energy (and a couple of Advil to help kill remnants from the night before) and mapped out a long-awaited route towards one of Berlin and Brandenburg’s many lakes. 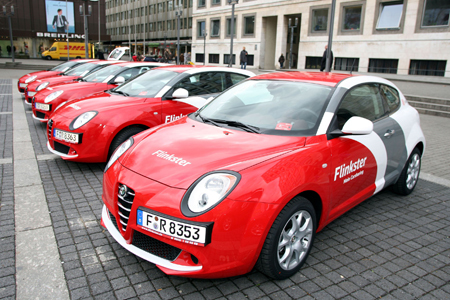 I decided I would be adventurous and sign up for a car on the DB’s Flinkster Car Share program. The program works like this – you decide you want a car, you go online, type in your time frame, they tell you where cars are available. A couple of small details are that a) I don’t know how to drive stick (very un-German of me!) and b) all automatic cars are electric. Theoretically, this doesn’t pose a problem for me. I don’t care if it’s electric or gas or whatever, as long as it works! When I first signed up for the program, I opted for the 10 EUR a month option since it almost halves the price of the rental once you take it. So I have now paid 10 EUR for the last two months…for a car I have never been able to rent! Why is that, you might ask? Why throw away money? Well funny story, today was the THIRD TIME I have tried to rent a car using my glorious car share program – the first time they said there was a car available and there wasn’t, the second time they called me a half hour before I was meant to pick up the car to be informed that the last user was unable to plug in the car properly to charge and so there wasn’t sufficient battery life to take it out! So here we come to today. 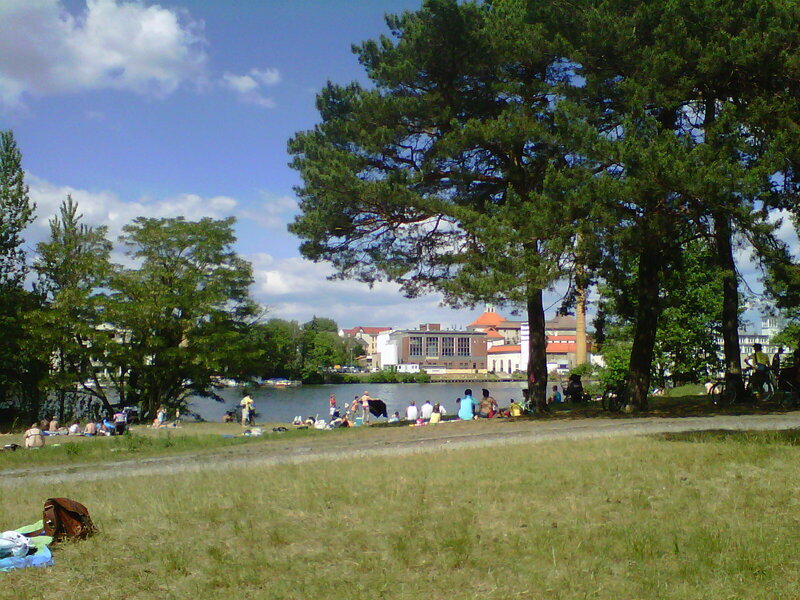 I pick my poison (Muggelsee out in Berlin’s former East) and then my company (lovely Carrie from the office) and I go to pick up my car which is just 2 blocks away from my apartment. I was really excited to see how the program worked, as I keep hoping small, inconvenient things may get easier once I have easy access to a rental (for about 2-3 EUR an hour!) So I arrive at the car, a little nervous and a lot excited. I unlock the doors (using my key card and an electronic pad in the front windshield) and I remove the electric plug from the “gas tank”. One of the many benefits of living in Germany is that everything is in German. So sometimes you understand, and sometimes you don’t. This time, I didn’t! I get into the car and see the gas/electric tank symbol flashing. This does not look like a good sign, so I decide to call Flinkster to make sure what the symbol means and to see if I should be concerned about driving the car. The woman on the phone assured me that if the symbol was not red, it was nothing to worry about and I could take the car out. Having never driven an electric car before, and being grateful for the advice of this professional, I decide it is okay to head out and go to pick up Carrie. As I had originally suspected, (lesson learned for the 100th time in my life to listen to my instincts!) the car had not been properly charged and the battery flat out died while we were on the road. This does not happen in cars run with gas! Well, maybe it does, but if you have two wits about you you check how much gas is in the tank before you go on a long drive! I called the company to report the problem, trying to keep my rising frustration and anger under control – and am told that I can call emergency road side assistance, go with the technician to the station where they need to recharge the battery, and can then take the car back on the road, (keep in mind it takes 3 hours to charge one of these babies.) The alternative, I was informed, was that they could call the service for me instead. And that is when the “cool” in me drained and I became one of those aggravating people who take their life’s frustrations out on innocent customer service rep.s. Except that this one deserved every little bit he had coming to him! I can’t even begin to describe the anger I felt as I tried “calmly” explain to this idiot well educated individual that I had called their technician to check the status of the battery, was informed it was okay, hit the road, and that this was in fact not my responsibility nor my problem. After being denied a Flinkster employee to come retrieve the car and wait with the Emergency Road Side Assistance, I told them I would simply leave the car where it was and abandon ship. They had already ruined enough of my day and I was not about to waste 3 hours of my time waiting for them to fix a problem I had no part in creating. They told me I could not do this. All in all, the morning was a mild disaster, but swayed by Carrie’s positive attitude and our desire to find a slice of sunshine by a lake, we called a cab to come whisk us away to a happy place called Muggelsee. The day ended successfully, at least! I spent a long time looking at the shoes. Nervous to try them out as I’ve read so many reviews where people warn you that your body needs time to adjust to the feel of the shoe, that your muscles might ache in new ways after a run, that your feet or toes may bleed as you break them in. That’s enough to almost make me never want to try them on! By the time I got home from the long afternoon my feet were a bit sore and I was grateful to have a break, but at least I was confident I could walk comfortably in the shoes without any strange pains or sensations. Then I decided I was ready for the first real challenge! So yesterday afternoon I strapped on my Vibrams and headed to the street. Feeling as awkwardas all the stares I was getting running past, I started a jog at what felt like the slowest pace on Earth! I was anxious, but moving confidently. In general, it felt like a very natural run, however I definitely noticed the lack of spring in my movements. There must be something in running sneakers that gives you an extra lift off the ground. For everything these shoes do not have that a typical Nike or Adidas running sneaker do, you make up for in pure muscle power and strength. 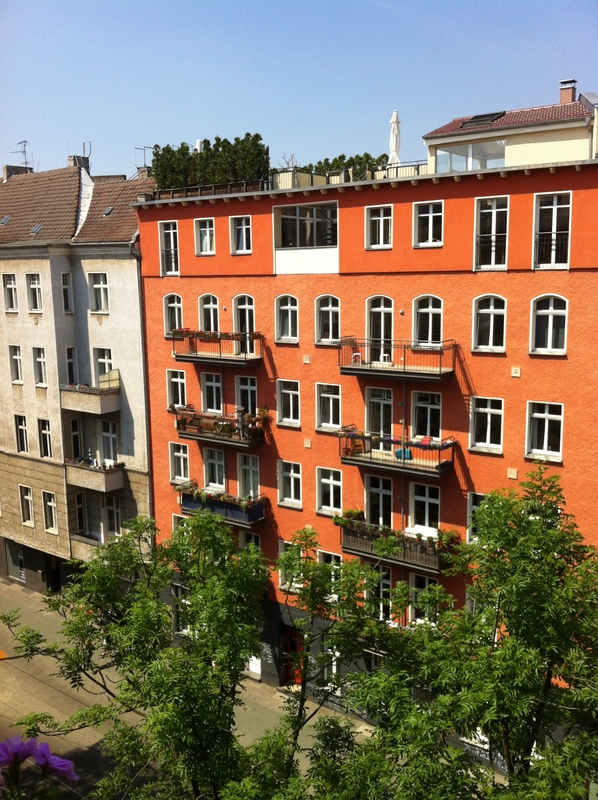 I made my way down Danziger Strasse, heading towards Volkspark Friedrichshain. My movements felt slow, but strong, and my breathing was stable. Normally by the 10 minute mark, after I haven’t (admittedly) run in 2 weeks, I am struggling for air, but this run felt different. My breathing felt controlled, and I was concentrating on the movement of my feet and leg muscles. I made it to the park in 15 minutes, and did a loop around the inner track before heading back to the street. Throughout the run I managed to encounter 4 different surface types: paved road, cobble stone, grass, and dirt path – the last of which was the most complicated. I think dirt or sand is hard enough while in regular sneakers, but I could really feel the movement of the sand beneath my feet. I was still moving forward, but had the sensation that my foot didn’t have a very good grip, so I switched to the grass and avoided all the sticks and pebbles I could. I can’t explain exactly how it felt while running, I could tell that I was using muscles in the back of my legs differently than I normally do in typical sneakers. Everything felt slightly more challenging, like it was only up to me to propel my body forward and nothing was stopping me from slowing down for a short break. But I kept moving, even though I felt a bit like a snail. I finished up at 3.8 miles (about 38 minutes), which is my exact average run (10 minute miler, over here!) and felt great knowing that the shoes had not slowed me down one bit! It was merely a different use of my muscles that felt foreign to me and made it seem like the world was slower, but actually, considering my easy breathing throughout the run, the shoes might have even made the exercise easier than sneakers. I gave myself a good stretch after the run – don’t want to risk injury or muscle cramps – and only noticed that my calf muscles felt tighter than usual. My feet felt a bit tired, I was grateful to take the shoes off, but there was no pain or blisters, (this is a huge plus since I switched from the sneakers in the first place due to the amount of blisters I was getting with every run!) I even did a bit more stretching before bed, just in case, but overall feel fine today. I still have the tightness in the backs of my lower legs, but I think this will be the case until my muscles adjust to the new running method. But so far I can definitely say running with the FiveFinger shoes has been a great decision. I’m excited to see where else these things can take me! Don’t put too much soil in the planter (as I’ve done) as it will overflow every time you water it! Wait until your neighbors are all asleep for the night to sweep the remaining dirt off your balcony to the ground below! Sit on your balcony or in your garden everyday after planting to enjoy the beautiful results of your hard work! 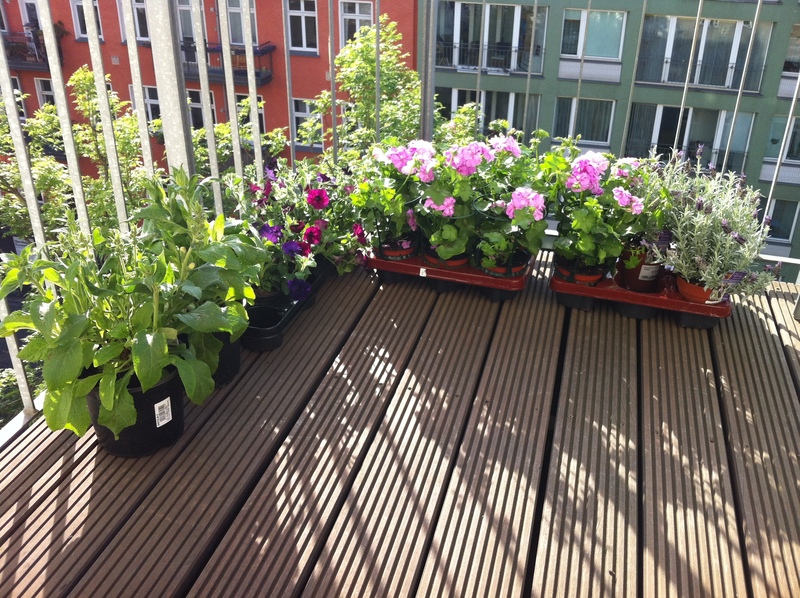 I recently embarked on yet another new adventure, balcony planting! 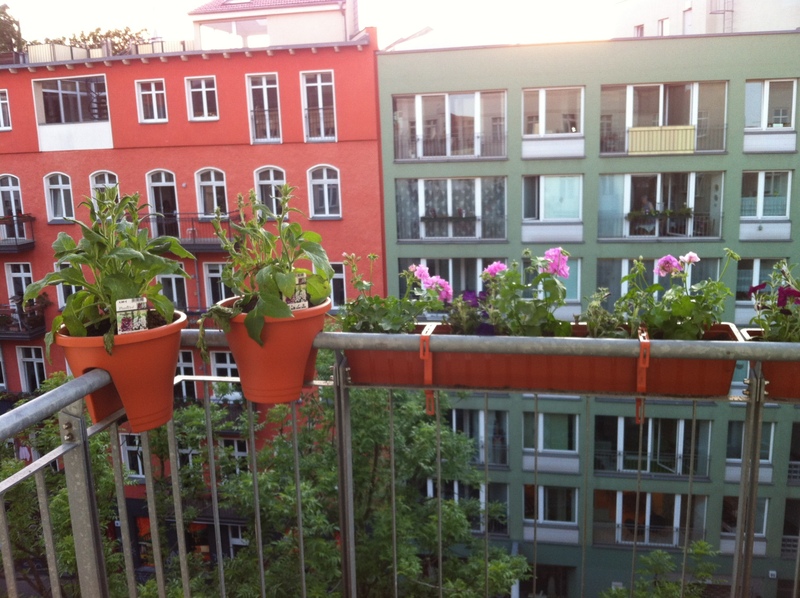 For some reason, unlike most large city dwellers, Berliners, (and Germans in general,) love to plant on their balconies! You will never see a balcony without floral adornments or green of some kind, and this is the perfect time of year to begin. I make an attempt last year, but have to admit I failed quite miserably within a short period of time, (probably about the same time I put ten plants in a window box made for 4!) They looked gorgeous for a week and then all sadly withered and died. This year I thought I’d give my not-so-green-thumb another try. Given my limited knowledge on the topic, I had to do plenty of research before heading to the plant shop. First, was my balcony sunny, partially sunny, windy? Second, how big is it exactly and what kind of planters can it hold? Third, what are my favorite color flowers and which will last the longest? This doesn’t even account for the simple, “how the hell do I plant these things?” questions that quickly followed. I started in two separate trips to the shop, (my plants for a car share fell through so I was forced to take taxis each time!) On day 1 I picked up the planters, which took about 1.5 hours as I stood dumbfounded in front of hundreds of different options trying to decide what to pick. After speaking with a very patient sales associate in my limited German, I finally decided on three 100cm boxes, two 30cm round over the railing planters, and one additional 60cm box for the angled corner of the balcony. It was a good choice, but to be honest I may go back for two more 100cm boxes since I still have the space and it should be filled up! Plus, I love the extra privacy on the balcony from the planters. Day 2 was all about the plants. I’d be lying if I said it took any less than 2-3 hours to pick everything out! But finally I chose plenty of geraniums and petunias in all different purples and pinks, and put some lovely lavender on the side and some gorgeous plants that won’t flower until June. 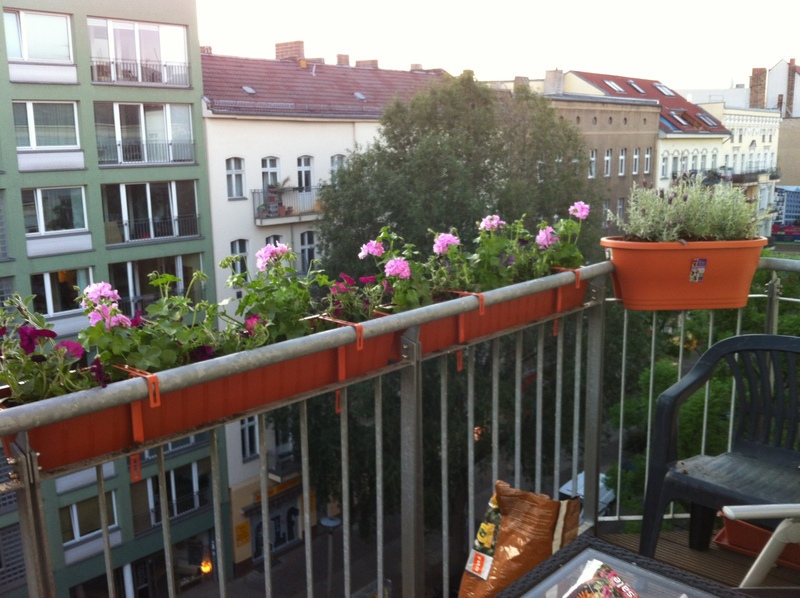 I made my way back home and went about setting up the metal brackets (to hold the plants in place on the balcony). This took much more time than I anticipated, so I was only actually able to plant the ready to hang boxes on that first day, but after a full day at the lake on Sunday, I came home and finished up the three large planters – filling them with purples and pinks to my heart’s content! It was already evening by the time I finished, (so the lighting in this shot isn’t great,) but here is a first taste of my balcony gardening expertise! I promise there will be many more shots to come as the flowers come into bloom and sunny days fill my balcony over the summer! Ah, sporadic blog posting. How I hate you! I might as well take the time to explain the lack of posts lately. Life has truly gotten in the way! So here I am, back in Berlin, almost 1 week to my return, and I finally feel like my muscles are not about to collapse, or my eyes close 1 hour after I first open them. And the shakey feeling that I might be getting a cold is not haunting me every morning when I wake up. So, good riddance jet lag and crazy travel schedule! (For a few weeks at least.) And hello blog world. I have missed you so! No Pants Parties Every Day! Anything goes when you live alone. Really, anything. In fact, sometimes I think it might be hard to return to the reality of living around others since I am so ingrained in my own little world here. I don’t close doors when I use the bathroom or shower. I can cook or eat meals at any random hour I choose. I can play music as loud as I want, or on repeat ad nauseum without bothering anyone else. I take baths ALL THE TIME wasting hours at a time, no one knocks or asks me to hurry up. What do you do when you live alone?